I don't often use two gemstones in my creations but sometimes there are stones that just beg to be together. These two Topaz gems make a wonderful pair. 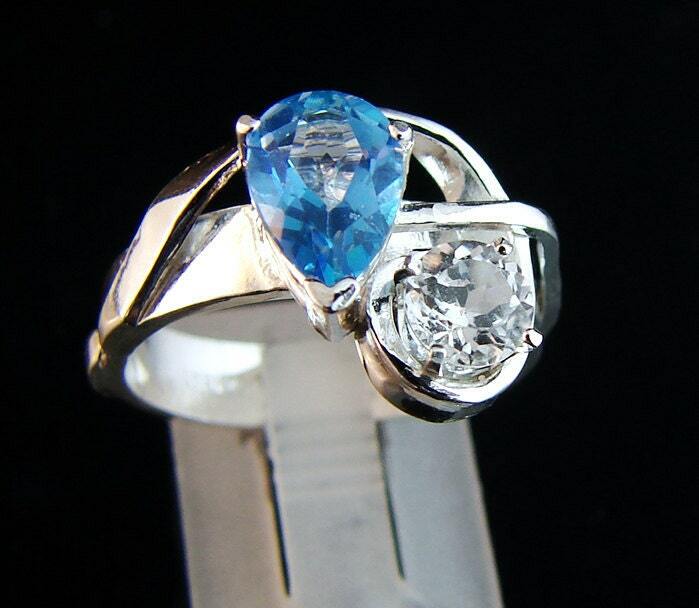 The larger stone is a deep blue pear cut gem that is 9x7mm and 1.50carats. Sitting playfully in front of it, is a 5mm round White Topaz that is .50carats. Both gems sparkle like crazy and the colors play off of each other. I guess I should have called this ring 'Party of Three' because the silver has certainly joined the celebration. The one of a kind band is handmade from sterling silver. A ribbon of silver hugs the smaller gem then circles the larger one. This ribbon continues all the way around the ring and loops over itself back at the gemstones. The band is 12mm wide at its widest point and 4mm on the palm side. Life is too short to wear ordinary jewelry! My rings come in a lovely ring box tied with a bow. It will be beautifully packaged and will arrive by insured mail within the US. For my international customers, I use flat rate Priority mail whenever possible.